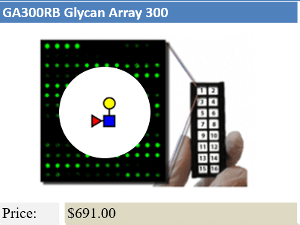 Glycan arrays provide a convenient tool to determine the carbohydrate-binding characteristics of antibodies, proteins, bacteria, and cell cultures. 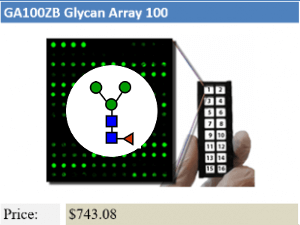 We also produce custom glycan arrays on demand from our large library of glycans. 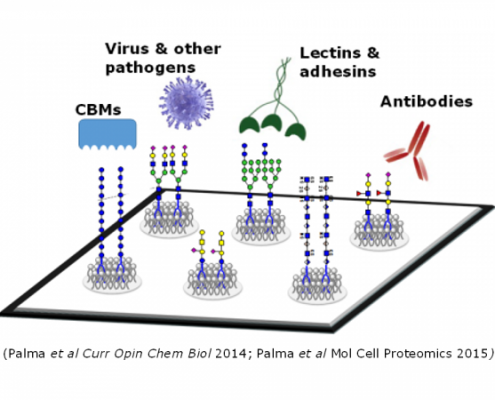 Immobilization – Printed glycans are non-covalently immobilized to individual wells utilizing close-structure reducing ends of glycans, typically ketones or aldehydes, and chemistry. 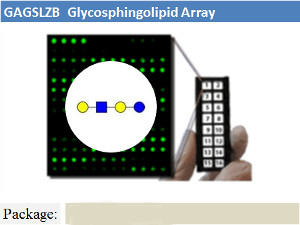 For example, hydrazide functionalized slides utilize Shapiro’s reaction to immobilize glycans. 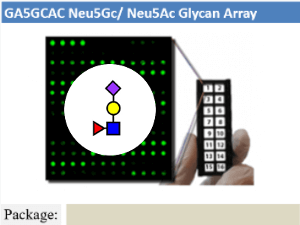 Protein Binding – A naturally isolated or chemo-enzymatically synthesized glycan-binding protein is applied to the slide. Fluoresence Labeling – Fluorescent label is directly applied to biotinylated proteins or attached to a secondary antibody. 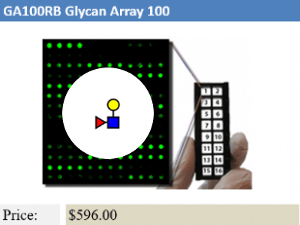 Detection – The array is screened using a fluorescence detector. 1. Rillahan, C. D. & Paulson J. C. Annu Rev Biochem, 2011, 80, 797-823. 2. Amonsen, M.; Smith, D. F.; Cummings, R. D.; Air, G. M. J Virol 2007, 81, 8341-8345. 3. Paulson, J. C.; de Vries, R. P. Virus Res 2013, 178, 99-113. 4. Stencel-Baerenwald, J. E.; Reiss, K.; Reiter, D. M.; Stehle, T.; Dermody, T. S. Nat Rev Microbiol 2014, 12, 739-749. 5. Park, S.; Shin, I. Org Lett 2007, 9, 1675-1678. 6. Pourceau, G.; Chevolot, Y.; Goudot, A.; Giroux, F.; Meyer, A.; Moules, V.; Lina, B.; Cecioni, S.; Vidal, S.; Yu, H.; Chen, X.; Ferraris, O.; Praly, J. P.; Souteyrand, E.; Vasseur, J. J.; Morvan, F. Chembiochem 2011, 12, 2071-2080. 7. Laurent, N.; Voglmeir, J.; Flitsch, S. L. Chem Commun 2008, 4400-4412.